A spokesman said there was "no cause for worry" and that he was travelling for a "follow-up" consultation. 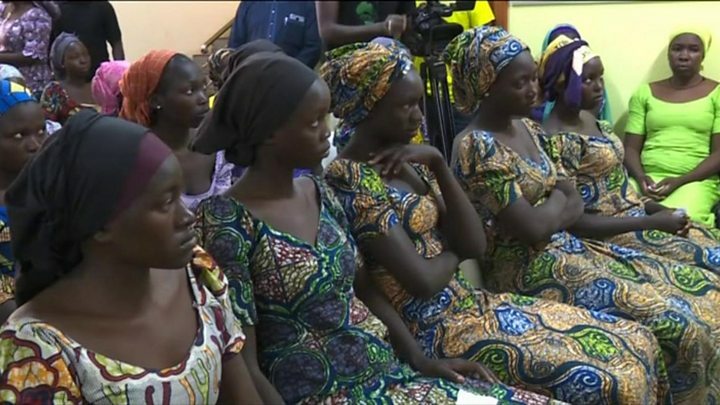 "I cannot express in a few words how happy I am to welcome our dear girls back to freedom," Mr Buhari told the girls in Abuja, according to his office. "On behalf of all Nigerians, I will like to share my joy with you," he said. Arriving in Abuja earlier, some of the girls looked tired and confused by all the attention after spending three years in captivity. Before being taken to the capital, they were brought by road convoy from a remote area to a military base in Banki near the border with Cameroon. "This is good news to us. We have been waiting for this day," Christian pastor Enoch Mark, whose two daughters were among those kidnapped, told Agence France-Presse. "We hope the remaining girls will soon be released." It was unclear whether his daughters had been freed. A statement from a spokesman for President Buhari earlier said he was deeply grateful to "security agencies, the military, the Government of Switzerland, the International Committee of the Red Cross, and local and international NGOs" for playing a role in the operation. In a later BBC interview, presidential spokesman Garba Shehu added: "With all of these things together we negotiated over a period of several months, and at the end of it some of their [Boko Haram's] members were exchanged for the 82 girls." Last month, President Buhari said the government remained "in constant touch through negotiations, through local intelligence to secure the release of the remaining girls and other abducted persons unharmed".